Washington (CNNMoney.com) -- Federal Reserve Chairman Ben Bernanke warned Congress Wednesday that the economic outlook remains "unusually uncertain," but stopped short of revealing what the Fed might do to sustain the shaky U.S. recovery. There had been growing expectations on Wall Street that the Fed chairman would give a clearer signal about additional steps the central bank might take to spur the economy in the face of growing weakness. What is your biggest economic priority? Instead, his semi-annual testimony offered little new policy direction, focusing on expectations that economic growth would allow the Fed to eventually pull money out of the system and raise short term rates, as the economy improves. And while he acknowledged growing signs of weakness in the recovery, he gave a vote of confidence that the economy would avoid falling into another recession in the near term. "We don't think a double-dip [recession] is a high probability," he said. Some economists have questioned whether the Fed has run out of options by keeping rates near 0% for the last 18 months. Bernanke said the Fed still has tools necessary to spur growth, even with interest rates unable to go any lower. But he gave few details about what the Fed might do if it decides the economy needs more help. "We have not come to the point where we can tell you precisely what the leading options are. Clearly each of the options have potential drawbacks," he said in response to questions. "They're not going to be the conventional options. We need to look at them carefully to make sure we're comfortable with any steps that we take." He said the Fed could change its statements in order to give confidence to markets about future growth. And he said the Fed could try to encourage banks to reduce the cash they are holding, which would pump more money into the economy. To do this, the Fed could lower the interest it now pays on the reserve accounts banks have on deposit with the 12 regional Federal Reserve banks. Currently, the Fed only pays 0.25%. Despite that low rate, banks collectively have about $1 trillion in excess reserves in those accounts. U.S. stocks, which had been little changed before his 2 p.m. ET testimony, fell sharply once his remarks were released, with the Dow Jones industrial average and the Standard & Poor's 500 index both closing off more than 1%. "Anyone hoping for a signal that the Fed was preparing to provide some further monetary stimulus to boost the flagging U.S. recovery would have been sorely disappointed," said Paul Ashworth, senior U.S. economist for Capital Economics. "The bottom line is that monetary policy isn't going to be loosened; the best that can be said is that it isn't going to be tightened for several years either." Senate Banking Committee Chairman Chris Dodd, D-Conn., seemed to be one of those pressing for additional action, stating in his opening remarks, "It appears the economy is in need of additional help." 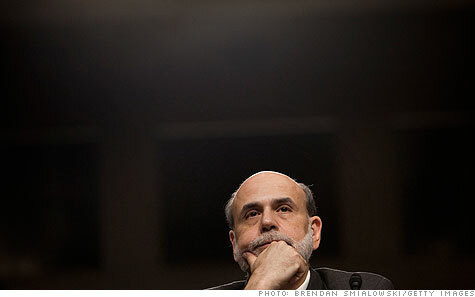 But Republicans on the committee questioned Bernanke about the threats posed by both the government's growing deficits. Bernanke repeated his earlier comments that the deficits are "unsustainable." Bernanke says that despite growing signs of weakness in the nation's economic recovery, he and other top Federal Reserve officials still expect "continued moderate growth, a gradual decline in the unemployment rate, and subdued inflation over the next several years." However, the Fed chairman says that unemployment will drop more slowly than was predicted earlier this year. And while not mentioning the possibility of a double dip recession in his remarks, he said the Fed also sees the risks for growth as "weighted to the downside." "In all likelihood, a significant amount of time will be required to restore the nearly 8.5 million jobs that were lost over 2008 and 2009," he said. And he emphasizes the "exceptional near-term hardships" on workers and their families, as well as the potential erosion of skills and possible long lasting effects on employment and earnings prospects. One other factor underlying the weaker outlook, says Mr. Bernanke, is that although financial conditions have improved significantly, they have become "less supportive of economic growth in recent months." He cites the situation in Europe as one contributing factor.